This Tuesday marks a first for us. We are today's stop on the Red Dawn Blog Tour hosted by PJ Blog Tours. This is our first time participating in a PJ Blog Tours and we thank them for including us. We have a guest post from author J.J. Bonds and there is a giveaway below. Can you tell us about your world building and what the new year at Crossroads Academy holds in store for Katia? Great question! World building is so important when you’re writing anything, but this is especially true for fantasy. After all, how do you make the paranormal seem, well, normal? I find that the best way to make the unbelievable believable, is to weave the paranormal elements in little by little amidst the mundane details. Readers don’t like an information dump and most won’t find it believable, so you have to give them one piece at a time-- just enough to whet the appetite! I’m a very visual person so I spend a lot of time imagining the setting, history, scenery, characters and the rules (in this case, vampire rules). But how to make all of those ideas come alive for the reader? Word building. I spend a lot of time outlining and making notes-- I make notes about everything. The start of a new school year is always tumultuous and it’s no different for the vamps at Crossroads Academy. A new year signifies change: new students, new relationships, and new problems. Even though Katia is starting to come into her own and begins to let her guard down with those closest to her, she’s still got a few things to learn. And true to her nature, Katia will learn them the hard way. 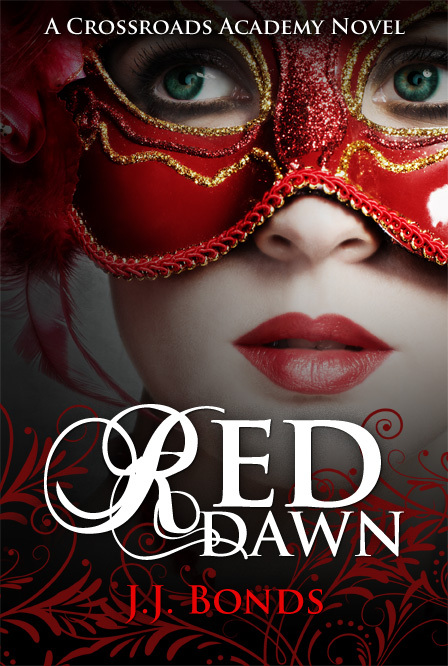 Red Dawn is an action packed adventure that will take Katia beyond the walls of Crossroads and test the bonds of friendship and loyalty. Readers will be thrilled to discover that Shaye plays a much larger role in this book and that Katia and Nik just might turn up the heat on their love/hate relationship before it’s all over. 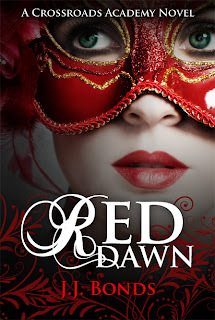 Thanks so much for featuring the Red Dawn blog tour on Reader Girls! I really enjoyed writing the post and appreciate your support of indie authors! J.J. Bonds Street Team--find details at this link. Choice between ebooks of CrossRoads or Red Dawn. Giveaway ends at midnight on September 18th. Open internationally. greetings, I just wanted to comment and say that I was really impressed with your blog. Keep up the good work! You are a really talented writer and it shows. What a beautiful cover! I enjoyed reading the guest post. Good world building is definitely the icing on the cake when it comes to novels. Thanks Lizzy and thank you for checking out the Red Dawn tour! Good luck in the giveaway!